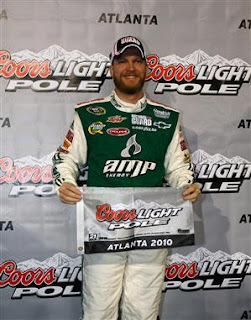 A pleasing site to the fans of NASCAR's most popular driver, Dale Earnhardt Jr ushered his #88 AMP Energy Chevrolet to pole position at Atlanta Motor Speedway in preparations for the 2010 NASCAR Sprint Cup's Kobalt Tools 500 on Sunday. Capturing his first pole since the spring race at Texas in 2008, Dale Earnhardt Jr has been on a tear in qualifying for 2010 placing in a top-4 starting spot for 3 of the first NASCAR Sprint Cup races. In the Atlanta qualifying session, 3rd driver to qualify Kasey Kahne took his #9 Budweiser Ford around the 1.52 mile oval at an average speed of 191.688 MPH or 28.922 seconds. Kahne held onto the 1st place spot through the following 8 cars until Jeff Gordon rolled to a time just 15 one-hundredths of a second faster than the #9 Ford. Gordon held the top spot for little more than a minute as the next car up, the #18 Toyota of Kyle Busch, bested the #24 Chevrolet's time. The first lap averaging a time faster than 192 MPH, Busch would be denied the pole by Dale Earnhardt Jr .
With the #88 car of Hendrick Motorsports claiming the first starting spot in the Kobalt Tools 500, car owner Rick Hendrick will enjoy seeing 3 of his 4 cars near the front with Mark Martin clocking in 4th and Gordon settling into a strong 5th in qualifying. Hendrick satellite team of Stewart/Haas Racing was able to place Ryan Newman in 7th and Tony Stewart in a fair 15th position. As for the #48 Chevrolet driven by back-to-back Sprint Cup winner of 2010 Jimmie Johnson, he could only muster a 16th place start. While Johnson lacked the qualifying speed in the late Friday afternoon time trials, the #48 Chevy came from 20th last weekend to win at Las Vegas. The Richard Petty Motorsports squad also reserves an honourable mention after NASCAR Sprint Cup qualifying at Atlanta Motor Speedway. With Kasey Kahne resting 6th, an determined run by Elliott Sadler's #19 Ford was a refreshing surprise in 8th ahead of David Ruttimann and Carl Edwards. As for the teams registering outside of the top-35 in 2009 car owner's points, Dave Blaney drove the #66 PRISM Motorsport to the highest of the cars needing to qualify for Sunday's race. Michael McDowell was the final driver to break into the field for the NASCAR Sprint Cup Kobalt Tools 500 at Atlanta Motor Speedway.